Workfare is one of the most exploitative aspects of the contemporary assault on the welfare state and the unemployed. It was advocated in the 1980s by the Republicans under Ronald Reagan in America, and in Britain by Thatcher’s Conservatives. At its heart is the attitude that the unemployed should be forced to work for their benefits, as otherwise they are getting ‘something for nothing’. Very many bloggers and activists for the poor and unemployed, including Mike over at Vox Political, Johnny Void, the Angry Yorkshireman, and myself have denounced it as another form of slavery. It’s used to provide state-subsidised, cheap labour for big business and charities, including influential Tory donors like Sainsbury’s. And at times it crosses the line into true slavery. Under the sanctions system, an unemployed person is still required to perform workfare, even if the jobcentre has sanctioned them, so that they are not receiving benefits. Workfare recipients – or victims – have no control over where they are allocated or what jobs they do. The government was challenged in the courts by a geology graduate, who was forced to work in Poundland. The young woman stated that she did not object to performing unpaid work. She, however, had wanted to work in a museum, and if memory serves me correctly, had indeed got a place at one. She was, however, unable to take up her unpaid position there because of the Jobcentre’s insistence she labour for Poundland instead. A young man also sued the government, after he was sanctioned for his refusal to do 30 hours a week unpaid labour for six months for the Community Action Programme. The High and Appeal Courts ruled in the young people’s favour. They judged that the government had indeed acted illegally, as the law did not contain any stipulations for when and how such work was to be performed. They are in no sense free workers, and it similarly makes a nonsense of the pretense that this somehow constitutes ‘voluntary work’, as this has been presented by the government and some of the participating charities. David Cameron, unsurprisingly, was also a fan of the Wisconsin system, and wanted to introduce it over here. In 2007 he made a speech to the Tory faithful at the party conference, proclaiming ‘We will say to people that if you are offered a job and it’s a fair job and one that you can do and you refuse it, you shouldn’t get any welfare.’ This became part of Coalition policy towards the unemployed when they took power after the 2010 elections. Two years later, in 2012, Boris Johnson, speaking as mayor of London, declared that he was going to use EU money from the Social Fund to force young adults between 18 and 24 to perform 13 weeks of labour without pay if they were unemployed. This has created immense fear among the unemployed and disabled. Standing quotes one man with cerebral palsy, who was so afraid of being sanctioned for not performing the mandatory work, that he felt physically sick. The energy and former Treasury minister perhaps knows more than she has previously let on about the power of financial backing to influence views and policy. Leadsom herself ahs had plenty of financial backing from the offshore hedge und run by her brother-in-law Peter de Putron, as has the EU-sceptic Open Europe thinktank, she has championed (Eyes passim ad nauseam). What result the Guernsey-based donor hopes for is not known. But plenty of other hedgies want out so they can escape EU regulation of their funds (inexplicably confident that a British Tory government would be kinder to them). Others are just pleased it’s all getting nice and tight so they can take positions on sterling and cash in on the early exit poll information they are paying for outside the polling booths. (p. 7). Her connection to hedge funds and their managers should be one good reason alone why no-one should take Andrea Leadsom remotely seriously. Many of the private care home chains that collapsed a few years ago were run by hedge funds, as is a private hospital in Bath. These organisations see health and social care as a lucrative investment, and their financial arrangements are so organised in order to make it appear that the firms are operating close to their margins so they can benefit from tax breaks. As a result, the care homes and hospitals they manage are often underfunded and genuinely in a precarious financial situation. Hence the appalling failures of several care homes to provide acceptable standards of care to their elderly or handicapped inmates, and their spectacular collapse. And unfortunately, at the moment the hedge funds and the parasites in charge of them are all too right in their expectations that a British Tory government won’t tax them. The Tories have shown absolutely no interest in doing so up to now. In fact, quite the opposite. They are trying to do their best to protect London and the rest of the country as a low tax haven for dodgy businessmen and financial speculators right across the world. It’s why one international politician declared Britain to be one of the most corrupt countries in Europe, because of the safety it provides to gangster right across the continent and the globe to launder their ill-gotten gains. The Tories are quite comfortable with this vile situation, and will do everything they can to protect it as far as possible, up to and including Brexit. Private Eye printed this piece about the corporate sponsorship of the Tory conference that year in their issue for the 4th – 17th September 2009. David Cameron has warned lobbyists to keep their distance at the Conservatives’ forthcoming party conference in Manchester. With the keys to No. 10 within his grasp, the last thing Dave needs is another cash-for-access scandal. But corporations that want to get close to the PM-in-waiting can always go the think-tank route. Policy Exchange is the most Cameroonian of these bodies, and its preliminary conference timetable shows how easy it is for business interests to pay for face time with shadow ministers. Shadow energy minister Charles Hendry will be speaking about “energy security and decarbonisation” courtesy of Oil & Gas UK, the trade body for the North Sea oil firms, alongside the group’s chief executive. As the meeting is being paid for by the oil lobby, energy security will most likely trump global warming, and wind and wave power, like energy saving, will not get much of a look-in. Shadow health minister Stephen O’Brien will be discussing whether funding for long-term care should be by “individual, state or partnership”. The answer may well be by “partnership” because the meeting is being paid for by Partnership Assurance which specialises in funding elderly care through equity release and insurance schemes and so has a direct interest in less government funding for elderly care. Fellow shadow health minister Mark Simmonds meanwhile will discuss whether “We need more public health initiatives for the worried well?” The obvious answer would be ‘No we don’t”, but as the meeting is sponsored by Alliance Boots, which would love to be involved in government health initiatives to drum up more business, the answer may well be in the affirmative. Shadow business minister Mark Prisk is addressing a meeting called “Britain won’t be great if we don’t make anything anymore”, paid for by the arms firm BAE Systems. He will speak alongside BAE’s spin doctor, Bob Keen. BAE’s contribution to Britain’s greatness includes taking huge amounts of the defence budget for military kit marred by cost overruns and late delivery – overpriced and late schemes like the Astute Class Submarine (£1bn over cost, four years late) about which the Tories have been making a fuss. The British Airports Authority, so close to the current government, is taking no chances with a new administration and so is sponsoring a meeting on “infrastructure” with George Freeman, Cameron’s “A List” candidate for the safe Tory Mid Norfolk seat. BAA’s spin doctor, former spokesman for Tony Blair Tom Kelly, will also address Tory delegates at the meeting. Shadow culture minister Ed Vaizey meanwhile will be talking about “the future of television ” on a platform funded by BT Vision, alongside the TV-on-the-internet firm’s chief executive. BT Vision of course currently lobbying the government to merge with Channel 4. So no hidden agenda there. This shows how duplicitous Cameron has always been in trying to deny the corporatist agenda behind the Tory party. He wanted to hide the influence of the lobbyists at this party conference, just as his lobbying bill is supposed to make government more transparent by limiting them at Westminster. In fact, it’s aimed at charity and other political pressure groups and denying them access, and leave the corporate big boys untouched. And it also shows the very deep connections between his Tories and the corporations seeking to profit from privatisation and government outsourcing. This afternoon I put up a piece showing the continuity between Trump’s plans to exclude Muslims from the US and compel the registration of those already in the country with the round up of Arabs and other Middle Easterners as ‘suspicious persons’ under George Dubya after 9/11. I’ve also been alarmed that Conservatives on both sides of the Atlantic will move from interning Muslims and persecuting other minorities, such as Mexicans and Blacks in America, to incarcerating left wing and labour activists. In the 1970s at the head of the paranoia about Harold Wilson MI5 and MI6, along with elements in the Tory party, were planning a coup. They investigated the possibility of setting up an internment camp for 40 MPs, ‘not all Labour’, and a total of 5,000 others, including journalists, youth, minority and senior citizens’ activists, as well as trade unionist, and members of the Socialist Workers and Communist parties. Kampfner traced the DeLay’s office’s assault on the unions to the Red Squads that were set up by the police forces in major cities like New York, Chicago and Los Angeles in the 1920s to combat ‘subversives’. These included Communists, Anarchists, civil rights activists, feminist activists, trade unionists and just about anybody else they thought was a threat to good, Right-wing patriotic American values. (p. 243). I blogged the other day about the Tories’ plans to build a special prison for radical Islamists following Mike’s article on this. Mike considered this approaching the Nazi concentration camps. I concur. It looks very much like the first steps towards creating internment camps. And it won’t just be Muslims that will eventually be interned. There are enough people on the British Right, who share the Republicans’ attitudes that trade unionists and organised Labour are a subversive threat. Much has been written recently about the various employers’ groups, who compile black lists of trade unionists and other ‘disruptive’ workers and pass them on to firms so that those same workers don’t get jobs. There have been a number of excellent documentaries on them since the 1980s. One of them was Hakluyt, but there are others. Hakluyt was the successor of a much older organisation dating from the 1920s, the Economic League against Industry Subversion. And several of the national papers have also demanded that striking workers should be jailed. I can remember reading a piece in the 1980s in the Sunday Express, which recommended that laws should be passed preventing workers in essential industries from going on strike. Those who did, like air traffic control personnel in America, should then be arrested and jailed. Cameron has already passed a series of legislation designed to emasculate the trade unions. In the latest of these, he allowed employers to hire scab labour from agencies, though reducing the right to strike to being merely symbolic. This has been criticised by the International Labour Organisation in the UN. It also follows a long line of anti-union legislation passed by the Tories, and similar actions intended to break up strikes by the Italian Fascists and Nazis in Germany. And members of his own party attacked part of his anti-union legislation. This was the clause demanding that trade unionists on pickets should give their names to the police. Even David Davies, the right-winger’s right-wing, found that a step too far and called it ‘Francoist’. Given the authoritarianism and intolerance of Cameron and his aristo cronies and the way they and their Lib Dem enablers pushed through the establishment of secret courts to try accused terrorists, I think it is all too possible that after the Republicans in America and Tories over here have finished rounding up the Muslims, they’ll start on trade unionists and organised labour. All while loudly claiming that they stand for freedom, transparency and democracy, of course. I’ve blogged several times about the threat to the NHS from the Tories and the Lib Dems. There are 92 Conservative and Lib Dem ministers, who advocate the privatisation of the Health Service, and who stand personally to gain from it. They include Iain Duncan Smith, the current minister for culling the poor, the sick and the old. 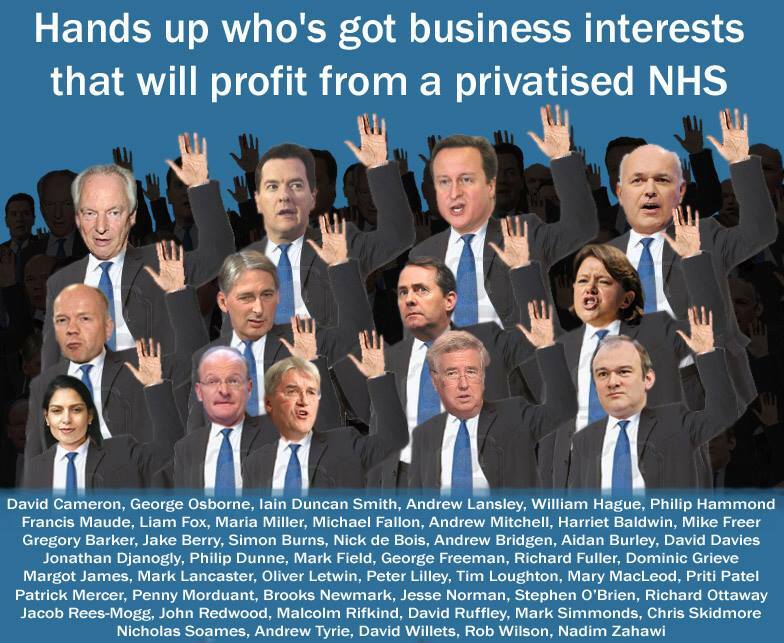 Andrew Lansley, the current health minister, has openly stated he is in favour of privatising it. So has Nigel Farage, and the Unterkippergruppenfuhrer, Paul Nuttall. I blogged earlier today about the Fuhrage’s forked tongue about the NHS, and how he follows the Tory policy going all the way back to Thatcher of promising to defend it while secretly plotting how to sell it off. In the 1980s, Thatcher set up a review into the NHS and its funding. This so alarmed Labour’s Robin Cook, that he wrote a Fabian pamphlet, Life Begins at 40: In Defence of the NHS, attacking possible proposals to privatise the Health Service. Cook’s pamphlet also graphically described the patchwork state of healthcare in Britain before the NHS. In London, where there were plenty of paying customers, there could be hospitals in neighbouring streets. Out in the poorer British provinces, there were hardly any, and many operations were carried out not by surgeons but by GPs. He cites Julian Tudor Hart’s book, A New Kind of Doctor, to show how bad this could be. Hart described how he joined one of those practices in Kettering. One patient was left under anaesthetic as the London specialist operating on him was called away to continue a stomach operation on a London patient, which the operating GP had been unable to complete. Cook was deeply concerned that the Tories’ review would not be at all interested in improving quality, only in opening up the NHS to the market and privatisation. One of the issues he tackled in the pamphlet was the possibility of the introduction of private health insurance. This covers two pages and a column and a bit in the original pamphlet. This is what he wrote, though emphases and paragraph titles are mine. The mechanism proposed to square the incompatibility of health care with the market is insurance. All market approaches to the NHS submitted to the Review stress the case for much wider private insurance and almost as frequently propose subsidies to boost it. The first thing to be said is that private insurance does not offer to health care the alleged benefits of the discipline of the market place. At the point when the individual requires treatment he or she has already paid the premiums and has no incentive not to consume as expensive a treatment as can be reconciled with the policy. The position of the doctor is even more prejudiced in that he or she has every incentive to obtain as much as possible from the insurance company by recommending the most expensive treatment. Both patient and the doctor are in a conspiracy to make the consultation as costly as possible, which is a perverse outcome for a proposal frequently floated by those who claim to be concerned about cost control. The compulsion in an insurance-based system to maximise the rate of return is the simple explanation why intervention surgery is so much more often recommended in the United States. For example, the incidence of hysterectomy there is four times the British rate. This is unlikely to reflect higher morbidity rates but much more likely to reflect the greater willingness of doctors on a piece-work basis to recommend it, despite the operative risks and in the case of this particular operation the documented psychological trauma. I can guarantee that an expansion of private insurance will certainly meet the objective on increasing expenditure on health care, but it is not equally clear that the money will be spent effectively. One direct diversion of resources imposed by any insurance-based scheme is the necessity for accountants and clerks and lawyers to assess costs and process claims. The NHS is routinely accused of excessive bureaucracy, frequently I regret to say by the very people who work within it and are in a position to know it is not true. Expenditure in the NHS is lower as a proportion of budget than the health system of any other nation, lower as a proportion of turnover than the private health sector within Britain, and come to that, lower than the management costs of just about nay other major enterprise inside or outside the public sector. I am not myself sure that this is a feature of which we should be proud. ON the contrary it is evidence of a persistent undermanaging of the NHS, which is largely responsible for its failure to exploit new developments in communication, cost control and personnel relations. Nevertheless, there is no more pointless expansion of administrative costs than the dead-weight of those required to police and process and insurance-based system. These costs would be considerable. Part of this additional cost burden is incurred in the task of hunting down bad debts, which does not contribute in any way to the provision of health care. Forty per cent of personal bankruptcies in the US are attributable to debts for medical care, a salutary reminder of the limitations set to insurance cover. These limitations have three dimensions. First, insurance cover generally excludes those conditions which are chronic and therefore expensive or complicated and therefore expensive. Standard exclusions in British insurance policies are arthritis, renal dialysis, multiple sclerosis or muscular dystrophy. Most people do not require substantial medical care until after retirement. Most insurance cover excludes the very conditions for which they are then most likely to require treatment. Short of retirement, the most expensive health care required by the majority of the population is maternity care, which is also excluded by the majority of insurance policies. Secondly, insurance cover is generally restricted by upper limits which are arbitrary in every sense other than financial. I recently met a psychiatric consultant to a private clinic, who was prepared to discuss candidly the ethical dilemmas of treating patients whose financial cover is fixed at five weeks of residential care, but whose response to treatment may indicate that a longer period of hospitalisation is desirable. Thirdly, insurance cover is further limited by exclusion of those most likely to claim on it. I am often struck at the sheer healthiness of the patients who illustrate the promotional literature of BUPA and PPP who appear in such pink of good cheer and fitness that it is difficult to figure out why they are in a hospital bed. These models are though in a sense most suitable for the purpose as the objective of insurance companies is to attract the healthy. They therefore claim the right to screen for the unhealthy and reject them from cover. This discriminatory approach was defended earlier this month by the managing director of WPA, Britain’s third biggest health insurer, on the principled grounds that it meant ‘essentially healthy people are not penalised by unhealthy people.’ This statement has the advantage of originality in that it perceives healthy people as the vulnerable group and proposes a market remedy that protects them from the inconvenient costs of the unhealthy. Given this limited character of health insurance in Britain, the private sector is patently not in a position to substitute for the NHS and to be fair most directors of BUPA or PPP would be horrified at the notion of accepting the comprehensive, open-ended liabilities of the NHS. It is therefore perplexing that so much effort in and around the Review appears to be addressed to the issue of how the private sector may be expanded rather than how the public sector may be improved. Two major devices are being canvassed to boost private cover-tax relief on private cover or opt-out from public cover, or for all I know both of them together. Both would be a major mistake. Tax relief is open to the obvious objection that it targets help most on those who need it least – the healthy who are most likely to be accepted for private cover and the wealthy whose higher tax rates make relief most vulnerable. These are curious priorities for additional health expenditure. Moreover, even in its own terms of stimulating higher spending on health, tax relief is likely to prove an ineffective mechanism. If for example the average premium is £200 pa the cost of tax relief for 6 million insured persons will be £300 million. The numbers under insurance need to increase by a third before the increased spending on premiums matches the cost of the subsidy and provides any net increase in health spending. Up to that point it will always produce a larger rise in health spending to increase the budget of the NHS by a sum equivalent to the cost of tax relief. It is apparently being mooted that these objections could be circumvented by limiting the tax relief to the elderly. At this point the proposal moves from the perverse to the eccentric. This restriction targets help for private insurance on the very group for whom private cover is most inappropriate as their most likely health needs are the ones most likely to be excluded from cover. Only a moment’s reflection is required on the multiple ways in which we need to expand our health provision for the elderly to expose the hopeless irrelevance of tax relief as the solution for them. Opt-out is even more objectionable. The basic problem with opt-out is that it requires the payment towards the NHS of every individual to be expressed in a manner that gives him or her something to opt-out from. The principal attraction to Leon Brittan of his proposal for an NHS insurance contribution appeared to be precisely that it paved the way for opting out ( A New Deal for Health Care, Conservative Political Centre,, 1988). Nor is this inconvenience confined to the need for a whole new element in the tax system. If one in ten of the population chose to opt out, it would be remaining nine out of ten who would have to prove they were not opted-out when they went along to seek treatment. With the new contributions comes a requirement to maintain a record of payment of them, and presumably a mechanism for credits to those not in work but who do not wish to be counted has having opted out of the NHS. The more fundamental objection both these proposals is they explicitly threaten the NHS as universal health service catering for everyone. Moreover, they threaten its universality in the worst possible way, by encouraging those with higher incomes and lower health needs to get out, leaving behind the less affluent and the less fit. In this respect such an approach to the NHS would be a piece with the Government’s strategy of erosion towards the rest of the social services-housing, pensions, and now education, where the Government has encouraged those who could afford it to opt-out of public provision, leaving behind the poor who could be expected to put6 up with a poor service. This is the reality of the private healthcare system which Cameron, Clegg, Farage and the rest of the Right wish to introduce. It is expensive, bureaucratic, does not stimulating further spending, and excludes those with the most acute and expensive medical need, especially the elderly. And the Tories and their counterparts in UKIP and the Lib Dems know it. Why else would the Tories spend their time trying to deny what they’re doing? Why does Farage appear to be advocating retaining the NHS, while arguing for an insurance based system, like America? It’s because they know that private medicine does not provide the solutions they claim. It is only source of further enrichment to them and their corporate donors. And since Cook wrote that pamphlet, more than 20 per cent of all Americans can no longer afford their healthcare. It’s why the firms are trying to get their feet under the table over here. Don’t let them. Miliband has promised to reverse the privatisation of the NHS. Support him in the coming election.